At a time when Cape Town is suffering a major water crisis one local business is doing it’s bit to reduce water consumption and reinforce the message that every drop counts. Pienaar & Son, a boutique craft distillery based in Cape Town’s City Bowl, has launched a ‘Drought Edition’ gin with the aim of raising awareness around the water shortage, whilst reducing their own water consumption. As master distiller, Andre Pienaar, explains: “Gin comes out of the still at 80% alcohol and we usually then add around 200 litres of water, per batch, in order to get the strength of the gin to 43% alcohol. 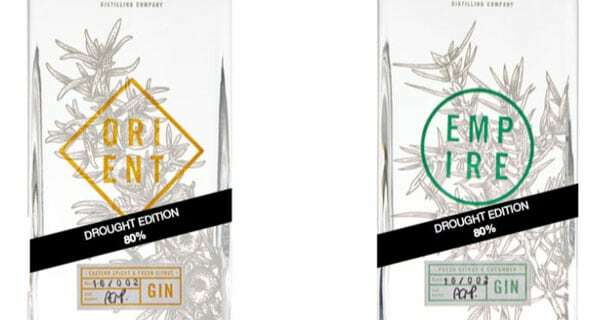 Pienaar & Son will produce a Drought Edition version of their existing gin varietals – EMPIRE and ORIENT. EMPIRE is a dry English-style gin infused with cucumber, grapefruit, fresh lemon peel and cardamom. ORIENT is a unique sweet and spicy Eastern inspired gin infused with vanilla, rosemary, orange peel and cinnamon. When Pienaar established the distillery in 2015, his vision was to create a range of gins that were a departure from the medicinal nature (flavour-wise) many traditional gins possess, and to deliver quality, modern spirits that were an ode to Cape Town’s past and cultural influences. With the current drought affecting the city, his hope for the introduction of the Drought Edition is to demonstrate that everyone can do something to save water. “It seemed so pointless when we’re trying everything we can to save water that we’re diluting gin. Over half a bottle of spirits at 43% alcohol is water. “The water doesn’t add any flavour, it just dilutes the alcohol to a sipping strength, and I imagine only a tiny portion of gin drinkers are enjoying it neat,” says Pienaar. Pienaar & Son believe in starting traditions, not following them. They also believe in helping to make a difference in the city they call home and with the Drought Edition they hope to have done just that. 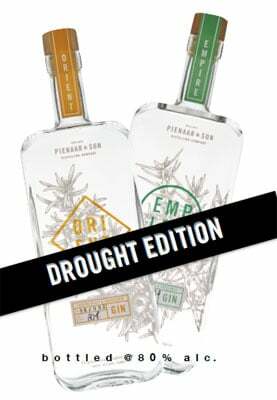 The Drought Edition will be available to purchase from February 26 from the distillery directly, online at www.pienarraandson.co.za and in speciality gin bars and liquor stores in Cape Town.